Our latest trip was to Tucson, Arizona for a few days at the Tucson Gem and Mineral Show. 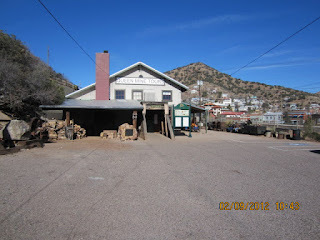 We decided to split up the gem show days with a day trip southeast to Benson, Tombstone and Bisbee. The highlight of the trip was to be the tour of the Queen Mine in Bisbee. It certainly did not disappoint. We were up at the crack of dawn, grabbed some breakfast and set out for Bisbee and the Queen Mine. The trip is just under two hours and the drive is nice. 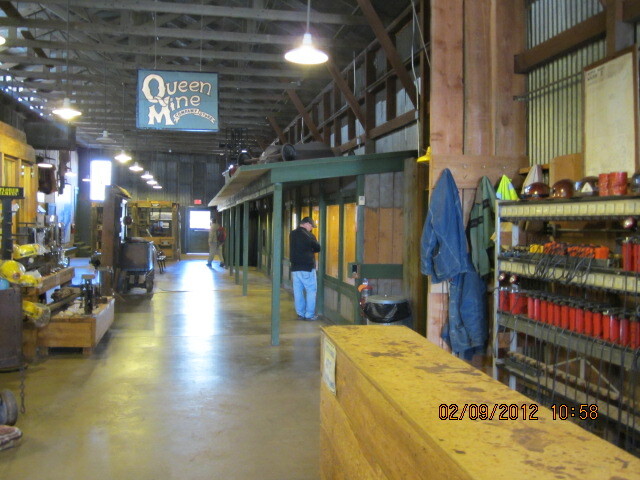 The Queen Mine offers five tours per day (9am, 10:30, noon, 2:00 and 3:30). The cost is a reasonable $13 for adults and $5.50 for kids 5-12. Under 5 and it’s free. Reservations are suggested but not required for your tour. We reserved places in the 10:30am tour and arrived in Bisbee about 9:30. We decided to take the short drive through Bisbee and check out the town. It is nestled in the mile high Mule Mountains and is basically a single winding street with artist shops, museums and Victorian homes. 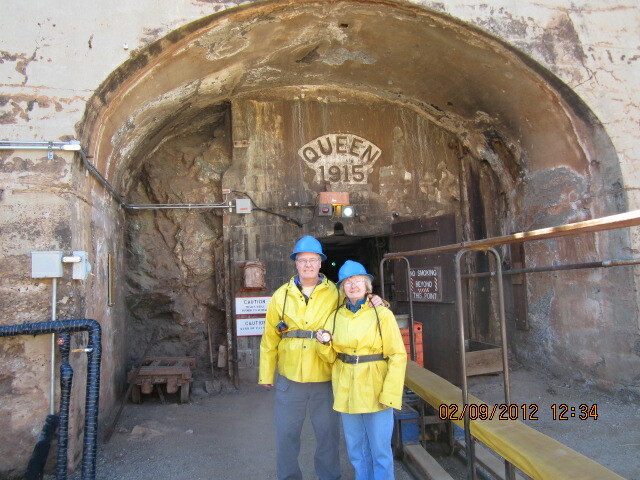 After surveying the town we headed to the Queen Mine and our tour. The Queen Mine is just on the outskirts of the city. Upon arrival you will need to check in at the front desk. As you wait for your tour time there is a wonderful gift shop to look through. There is also an extensive mineral collection on display with all the specimens for sale. The minerals are impressive and very reasonably priced. I picked up some vanadite and creedite. My mother bought a spectacular piece of native copper. Soon the shopping was over and it was time for the Queen Mine Tour! The Queen Mine proved to be one of the richest mineral sites in the world, producing nearly three million ounces of gold and more than eight billion pounds of copper, not to mention the silver, lead and zinc that came from these rich Mule Mountains. The tour is run by former miners that actually worked in the mine. Our guide had worked in the mine for 21 years! To say he was a wealth of information would be an understatement. In the lobby you get geared up. A hard hat. A big yellow coat. It is cold in the Queen Mine (high 40s). A belt with a battery pack and your own small spotlight. Once you are geared up you head outside and hop onto the exact same cars the miners used to ride. They are not terribly comfortable, but that is definitely part of the experience. The tour lasts an hour and you make three stops once inside. Each stop you unload and walk deeper into side cavities of the mine. At each stop your guide gives details about how the mine was built and how the miners worked. His first hand experience is quite interesting. After your three stops and discussions it’s time to head out and end the tour. I could not recommend the Queen Mine Tour more. 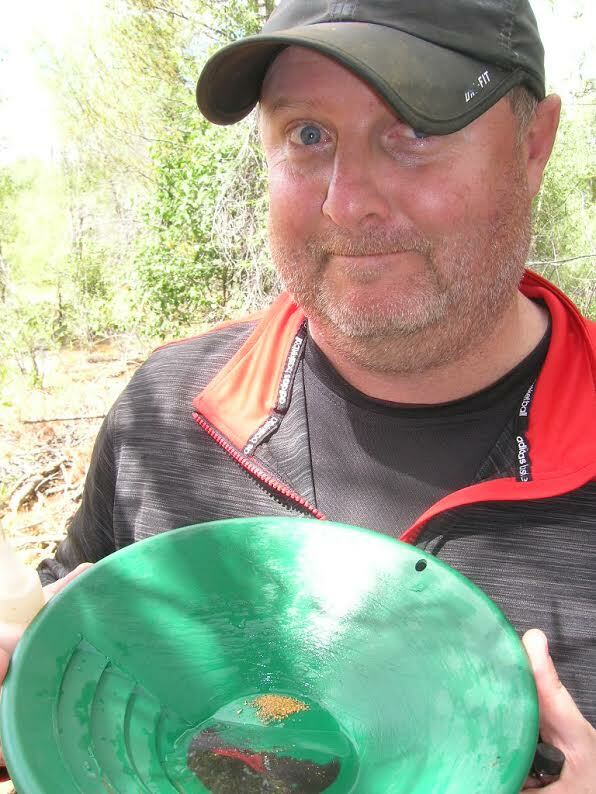 It is the best mine experience I have had and I have been to mines all over the western US. Once done with the tour head into Bisbee and check out the museums and cozy restaurants.